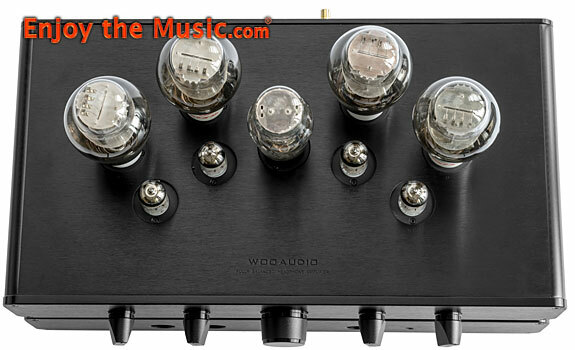 During 2015 I reviewed the Woo Audio WA7 Fireflies headphone amplifier / DAC combination. After only a few listening sessions, this vacuum-tube based component left me practically speechless. In fact, the headline to the review in Enjoy the Music.com was "I fell in love", which pretty much summed up my feelings toward this component. And now I'm very lucky to report on Woo Audio's flagship headphone amplifier WA33 ($7999), which has enough tube power and input flexibility to double as a preamplifier. Woo Audio describes the WA33 as a state-of-the-art, fully balanced headphone amplifier "that raises the bar in setting a new reference in music reproduction". 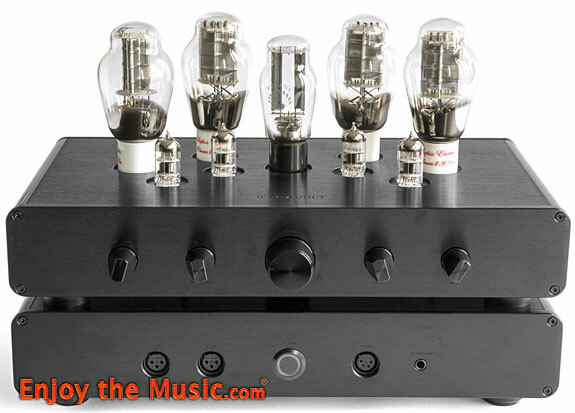 This headphone amp/preamp uses four 6C45 tubes as the drivers for four rather large 2A3 power tubes used as direct-heated triodes. Woo Audio claims that this amplifier delivers enough power to drive demanding headphones "to their full potential which maintaining a low noise floor for use with sensitive models". The WA33 separates the amplifier section from the power supply to eliminate any interference with critical audio components. In fact, the WA33 looks like two components, one stacked on top of the other, its Internal Coupling Architecture (ICA) technology lets the WA33 to merge with its power supply unit without an umbilical cord. The ICA also shortens the signal path, which reduces electrical interference and improves its sound quality. The WA33 uses Polytetrafluoroethylene (say that three times fast!) (PTFE) tube sockets, features point-to-point wiring, has user selectable high/low impedance and high/low level for headphone matching, and its anodized aluminum chassis is available in either black or silver. The cabinet of the WA33 is rather large, measuring 17.5" wide, and about a foot deep. It's 7.5" high, but that's without the tubes, the largest of them, the four 2A3s, make it about 5" higher. I copied most of the above technical information from Woo Audio's website. After they finish with the tech info, they start with the advertising hype, describing the WA33's sound quality prowess: "The expansive soundstage, holographic imaging, and rich tones that are pristine, natural, and vivid create a sense of realism that gives the user euphoric listening experience". I suppose if the WA33 doesn't perform as admirably as described, an audiophile could always upgrade their unit to the Elite Edition, which has custom-made transformers, improves the internal wiring, has an ALPS RK50 volume control which is one of the best volume controls money can buy, Mundorf capacitors, Cardas connectors, and has an Elite Edition 24 karat gold-plated plaque on its front panel. The unit reviewed here is not the elite edition, but it is still the nicest looking headphone amplifier I've ever reviewed for Enjoy the Music.com. Even though it seems as if on a daily basis audio manufacturer are releasing new models of headphones and headphone amplifiers that raise the bar not only in the area of performance, but price. Headphone listening has become very popular these days, and the manufacturers of this gear are responding in different ways, with more state-of-the-art headphones than any of us headphone loving audiophiles have ever thought was possible, but also by making more less expensive models, too, continuing to raise the bar on the price performance ratio. Since the Woo Audio WA33 is from the first category, I used the best headphones on hand to connect to this headphone amp / preamplifier. Using my reference Grado PS-2000e, Grado's top model and the best dynamic headphones I've ever heard, plus the planar magnetic OPPO PM-1, which is the best planar headphone on-hand.... Just for fun, I tried many other headphone models through the WA33, most of them not worth mentioning except maybe for my Sennheiser HD-600 headphones, which I had since 1999, but I had them refurbished by Sennheiser a few years ago as they replaced the drivers and just about every other working part(!). I sent an audio signal from my main system to the WA33 via a long run of Cardas interconnect that I connected directly to the outputs of either the EMM Labs DA2 digital to analog converter, or the phono preamp I was using at the time, either the Chorus Symphonic I reviewed at the end of last year, or my reference Pass Laboratories XP-15. If I was using a preamp with a tape output, I would have used it, but it wasn't such a big deal changing the cable connection to the source. In fact, some might say this method will provide a more transparent connection. I don't think it matters. Nevertheless, I began listening to the WA33 very soon after I received it. My reference headphone amplifier is a Pass Laboratories HPA-1, a very fine headphone amplifier that I have been more than very pleased with since I acquired it in 2016. Among its many fine traits, I like that it doesn't sound as if is powered by tubes, nor like a solid-state headphone amplifier, but just like a great headphone amplifier, period. When I reviewed the Woo Audio WA7 Fireflies, which was around the same time as I first heard the Pass Labs unit, I was blown away by its sound. I thought that it sounded a bit "tube like", but only in a good way. If one compares the sound of this headphone amp to live music, one will likely conclude that the WA7 sounds more like music than "tube like". Regardless of what I thought about this one-seventh the price headphone amplifier, as soon as I heard the first few notes of music coming through my headphones that were connected to the Woo Audio WA33 � what I had heard from other headphone amplifiers in the past became irrelevant. Did I expect anything less from the WA33? Not really. I could cut things short and simply say that the Woo Audio WA33 sounds like Woo Audio's less expensive WA7 Fireflies on steroids. Done. OK, I'm not going to do that. Not only is it not entirely true, but the WA33 deserves much more. It deserves more not only because it can unravel the nuances that appear on any recording that it is fed, but much more than that. It was obvious to me from the first day that I listened to it that it can provide the listener a musical experience that is second to none. The "soundstage" that came through my headphone when listening to the WA33 provide was extremely expansive. It took a while to become accustomed to this because at first it this huge sound-field (a much better word) a bit disconcerting. Instruments and voices that sounded as if they were coming from across the room, and often sounded as if they were originating from an adjacent room, occurred quite often. This didn't come across as some sort of parlor trick, because the sound I heard was obviously at the service of the music it was reproducing. The sound-field that occurred within the confines of my headphones wasn't one that sounded like what comes from a pair of stereo speakers, a surround-sound system, or even real life. But what it did was allow me to hear every sound, voice, and instrument that was on the recording, by separating every sound, voice, and instrument that was on the recording by a subjective distance that astounding. 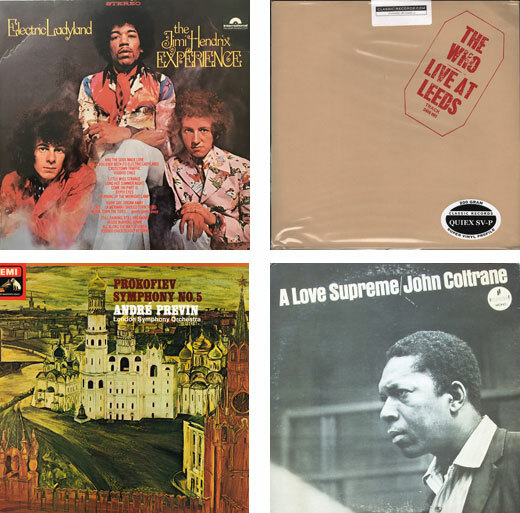 I played The Jimi Hendrix Experience's Electric Ladyland and was amazed at what I was hearing. The WA33 separated the instruments on this dense multi-track recording more than I've ever heard before, through a stereo system or a set of headphones. I thought this might not be the best album to use to "test" the Woo Audio WA33 because there is too much sonic variation between most of the tracks, especially on what was the first two sides of the double album. Side three and four has more consistency. But many of the tracks on this album were recorded years apart from each other at different recording studios. Yet, this didn't matter much. The WA33 was able to bring out the best on every track of the album. The bass response of this headphone amp was outstanding! It was akin to adding a subwoofer to a pair of bookshelf speakers! On many of the tracks Noel Redding's bass sounded fantastic, as I heard how the WA33 could dig down deep into the lower frequencies and at the same time retain its composure. Even when listening to this album on excellent equipment often all I can hear is "bass", not bass guitar, but through the WA33 I heard a bass guitar being played by a human being. As I mentioned, this varied from track to track, but on many of the tracks I felt as if I was hearing a woofer reproduce the bass, and by this I mean that I felt as if I could hear the bass compress the air around it, as low frequencies do when rattling the window frames and shake my gut when listening to good speakers in my listening room. Yes, this was an aural illusion. But so what? It was as if I was hearing real bass. And of course, this was true with every other recording I played through the WA33. The bass and soundstage (or whatever you want to call it) prowess of the WA33 is good enough to recommend this headphone amplifier on these two traits alone. As one would expect, though, there are those that are going to think that this is too much of a good think. 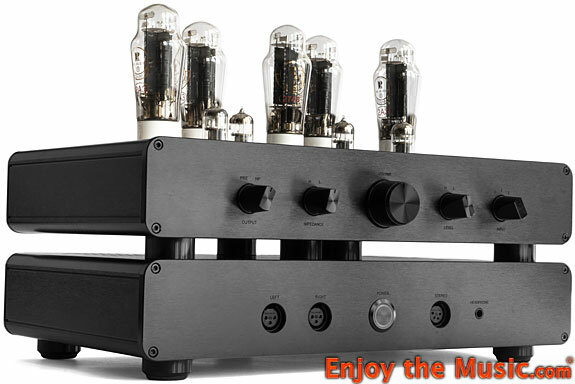 There is no doubt that when listening to this headphone amplifier it is powered by tubes, and rather large tubes at that. And that makes this headphone amplifier one that I don't think I'd recommend to a headphone listener who is in love with what some would call a typical "solid-state sound", an ultra-transparent, tight sounding (especially the bass) headphone amplifier that could be used in a studio environment to analyze a master recording. But, the tube power of the WA33 definitely works to its advantage when it comes to its midrange reproduction. I think the reason why the midrange of this headphone amp was so great was because of its relative clarity, which allowed the large swathe of frequencies that we call the midrange to arrive through my headphone's drives so uncolored it was startling. The transparency possessed by this headphone amplifier's midrange is such that I felt that I was "seeing" through to not only the source, but to the recording. What I mean by that is that the WA33's tube power somehow managed to "know" what voice or instrument it was reproducing, and somehow passed that information onto my ear-brain. So, when the WA33 was reproducing John Coltrane's tenor sax, in my headphones I didn't hear a recording of a tenor sax, but I heard a tenor sax. A real, physical, tenor sax. Yes, that is laughably impossible since a tenor sax is just over two feet long, and so it could hardly fit inside a set of headphones. Which is why when listening to John Coltrane's Love Supreme album, in the left channel I could hear his saxophone, and yet it was more than simply picturing a tenor sax in my mind as he played, but rather like hearing the physical presence of the instrument as it played. This description might seem like I'm exaggerating. But I had the opportunity to play this for a visiting audiophile. I let him put the headphones on, and then played the album. As soon as Coltrane's horn entered, he started waving his arms as if he was in a movie theater watching a 3-D movie for the first time. Before I started writing this review, I said to myself that there really wasn't much of a reason to break down how this component performed in different categories of its frequency response, bass, midrange, and treble. And yet after discussing some of its other sonic traits, I did just that. This might be due to the presence of its large tubes on the top of its cabinet, which aided in giving the Woo Audio WA33 what I can only describe as an organic sound, one that reproduced musical instruments and voices as many would describe as palpable. It was able to take the program material and present it simply as a music � often very dramatically � with a seemingly unlimited amount of somehow letting us in on the intentions of those who made the music on the recording. I suppose by describing its bass, midrange and treble response I could explain to others how it could do this, mostly because I don't understand why the Woo Audio WA33 performs as spectacularly as it does. And with that, I'll give a short description of its treble response. I also left the WA33's treble response for last because when listening to music, its treble response wasn't one that drew much attention to itself. Its sound certainly isn't attenuated, even though some likely assume that since this component is powered by tubes, its treble must be "softer" sounding than a solid-state headphone amp. Objectively, the treble of the WA33, when compared to my solid-state reference, might not be as ultra-extended. But judged on its own, when listening to music through the WA33 it never, ever occurred to me that its treble might not be as extended. I could hear everything that was recorded, and so when listening to, for example, Prokofiev's Symphony No. 5 as played by Andre Previn and the London Symphony Orchestra on EMI, I could hear everything that occurred in London's Kingsway Hall on the days or evenings when it was recorded. So, during the very exciting second movement, an unrelenting scherzo in Prokofiev's classic toccata mode, it frames a central theme in triple time. During this movement there are a host of percussion instruments employed, including but not limited to triangle, cymbals, tambourine, snare drum, wood block, and tam-tam. Not only was this an excellent demonstration of the WA33's soundstage prowess � it was as if the rear portion of the stage where the percussion was located formed a semi-circle around the circumference of my skull � it was also an excellent demonstration of how this headphone amplifier's treble response aided in accurately portraying every percussion instrument in this thrilling movement. Yet, there wasn't any time during this piece that I actually focused on the treble response of the WA33. It was very, very lifelike sounding that simply sounded like music. In fact, the sound of the percussion was distractingly lifelike � there were more than a few times that I instinctively turned my head to hear where a particular sound was coming from. The treble response of the WA33 was as good as any headphone amplifier I've ever had the pleasure of listening to, solid-state or tube. But the tubes of the WA33 gave it a leg up on most solid-state units, as the treble was not only lifelike, it included into its sound the dynamic distance I spoke of, where each percussion instruments was separated in space, regardless of how close each of those instruments were to each other on stage, or being played at the same volume. The sound was magical. 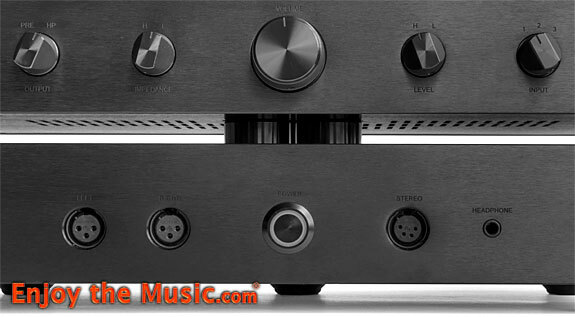 The subject of this review is the "Woo Audio WA33 Fully-Balanced Headphone Amp / Preamplifier", and so during the second half of the audition period I moved this component to the other side of my listening room and connected it to my main system. I continued to use it as a headphone amp, but I also started using it as a preamplifier. The WA33 has a balanced XLR output, and an input scheme consisting of a single ended RCA input and two XLR inputs. On the front panel of the WA33 is a switch that enables one to chose between using the component as a headphone amp or a preamp. Although the WA33 is designed to use as a preamplifier, it does not have many of the conveniences of a component that is primarily designed to be used as a preamp. Yes, it has three inputs and a preamp output, but that's about it. The WA33 has no mute switch, left and right channel balance, tape out, polarity control, remote, subwoofer output, bypass (home theater) output, or any other of the intangibles that one would expect from a modern preamplifier. But what it does have, is sound quality. The Woo Audio WA33 sounds amazing when used as a preamplifier. The WA33 is a beefy component at nearly 60 pounds. When I was using it as only a headphone amplifier, I placed it on an end table next to my listening seat. While there, the quite large 2A3 tubes populating the top of its cabinet exhibited more than a bit of microphony � softly tapping the top of the cabinet elicited a loud ringing sound into my headphones. Since there was no music playing in the room, and no people walking around the listening room while the music was playing that would cause any vibrations generated by footfall, this didn't matter that much. But this was certainly a concern when using the WA33 as a preamplifier, and so I set the WA33 on the second from the top shelf of my Arcici Suspense equipment rack. This not only quieted the microphonic nature of the tubes, but made it so any airborne vibration would be absorbed by the equipment rack's hung acrylic shelves. 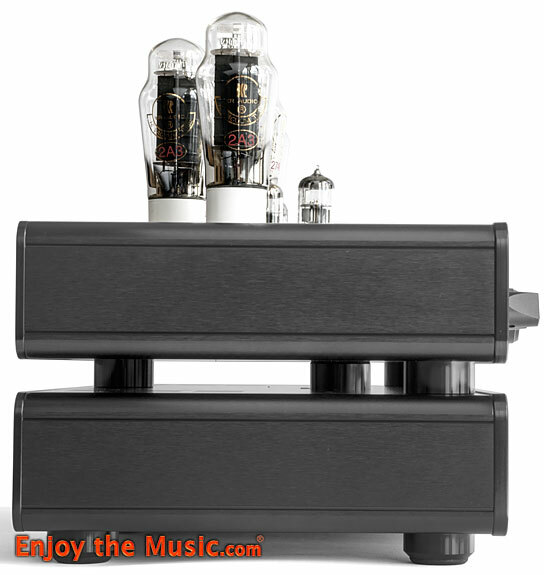 This was not a preamplifier that sonically fit into any other category but one designed with large vacuum tubes. Its performance was undeniably tube-like. I more than hinted about this sound when describing the WA33 when used as a headphone amplifier. But this characteristic was much more pronounced when using it as a preamp Those who like a tight, fast, ultra-transparent sound from their preamplifier should look elsewhere. But I actually liked it. Very much. The WA33 reproduced the bass frequencies superbly, as it reached very, very deep into the subsonic regions, producing a somewhat fat sounding, but at the same time a very powerful low-end sound. Perhaps this was because the WA33 uses 2A3 tubes, who I've heard have a reputation for having a robust sound. Nevertheless, the sound of the WA33 when used as a preamp was wonderful, as I sonically bathed in the sound that came from my system. No, it wasn't the epitome of neutrality, but listening to some of my old favorites through the WA33 with the volume cranked at night was one of the most exhilarating musical experiences I've had in quite a while. I played side two of Led Zeppelin's fourth, self-titled album on Classic Records, a showpiece for drummer John Bonham, as it felt as his floor tom-toms and kick drum were vibrating the fillings in my molars / Tangerine Dream's 1975 "Berlin School" electronic masterpiece from 1975 Ricochet with its fat, analog bass synth sound that seemed to vibrate the air in every inch of my listening room. While playing the Classic Records 200-gram version of The Who's Live At Leeds, I could easily imagine sonic holograms of John Entwistle on the left of the stage, Pete Townshend on the right, and enjoyed a Japanese pressing of David Bowie's The Man Who Sold The World that features producer Tony Visconti on bass, sounding as if he playing through one of those late 1960s to early 1970s bass amplifier cabinets with tuck-and-roll upholstery, the volume on its 200 Watt amp head turned up past 11. At the same time, the WA33 had a way with unearthing the inner detail of these recordings, playing back these classics with a huge soundstage that surrounded the front of the room, and enveloped me in sound. If Woo Audio added some modern conveniences, I bet they could manufacture a very popular preamplifier, one that trounces the competition. Even without the common preamp controls, I can't help but recommend the use of the Woo Audio WA33 as a preamplifier. It has a killer headphone output, too. 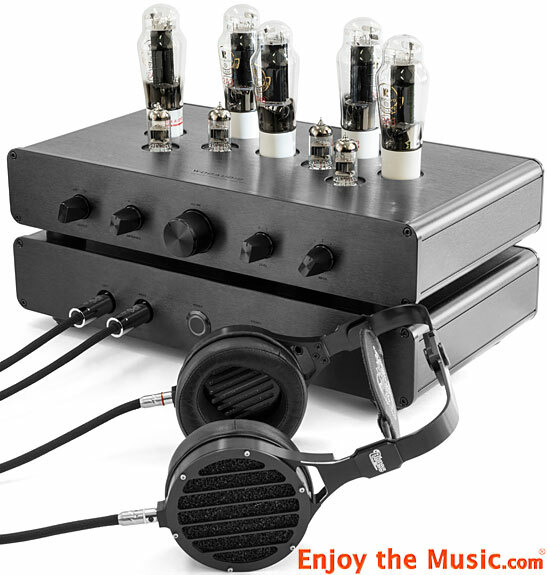 The WA33 is a fantastic vacuum-tube power headphone amplifier/preamplifier that Woo Audio should be very proud of. I think anyone who is able to come up with the $8,000 asking price for this headphone amplifier/preamplifier in its standard edition and decides to purchase this component has made an excellent decision. This is because the Woo Audio WA33 will allow this music lover to own a headphone amplifier that will be able to transport them to another world, one where the music is the only thing that matters. That the Woo Audio WA33 can double as a preamplifier is icing on the cake.